Can you believe that almost half the year is gone???? 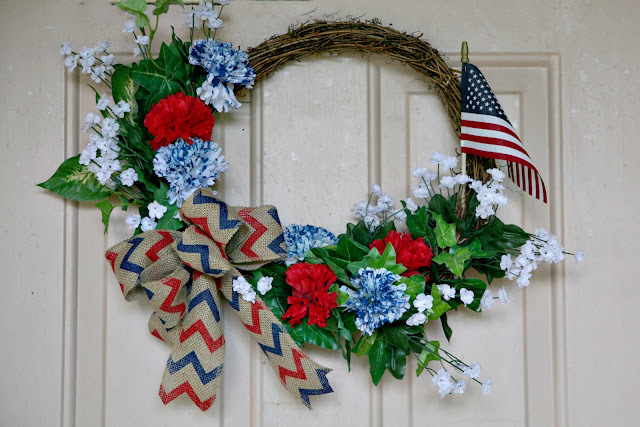 July 4th is right around the corner and before we know it Christmas will be here. 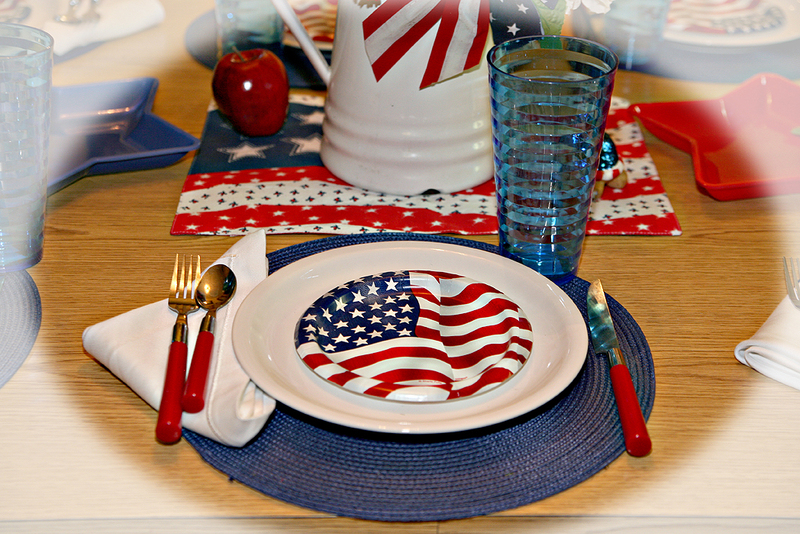 I decided to do a simple, kid friendly tablescape this year for July 4th. 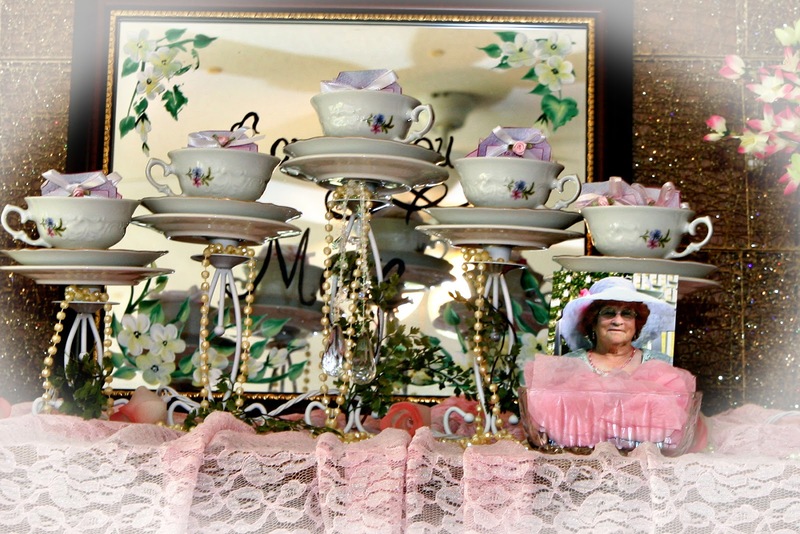 My oldest two grandgirls actually look forward to what "Nana's" next tablescape will be. I love it! You can't go wrong with white plates as you know. I decided to use paper dessert plates from the Dollar Tree. Patriotic, looks good on the white plate and toss when you're done! 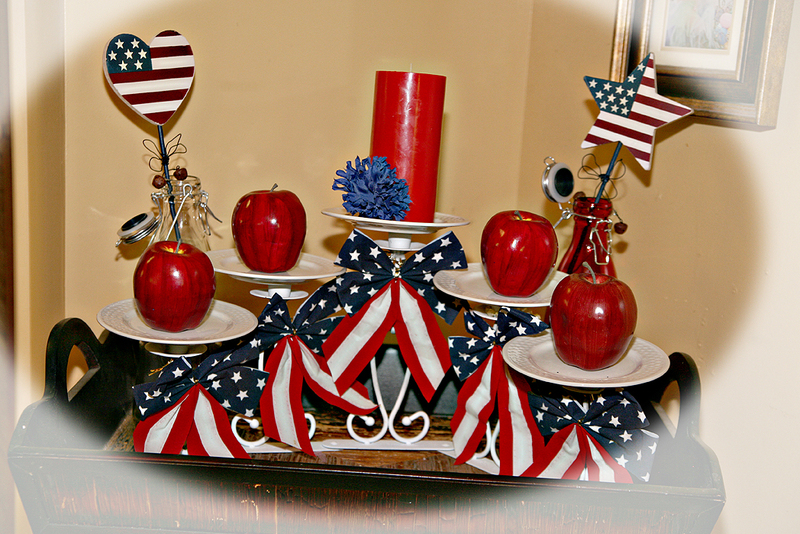 I bought quite a few packs as I have had my July 4th tablescape up for some time. Love this little guy...and so does the grandbabies. Simple with a mixture of real, paper and plastic! Love it that you can mix and match. Remember when I used this yard sale candle holder I found for a tea party just recently? 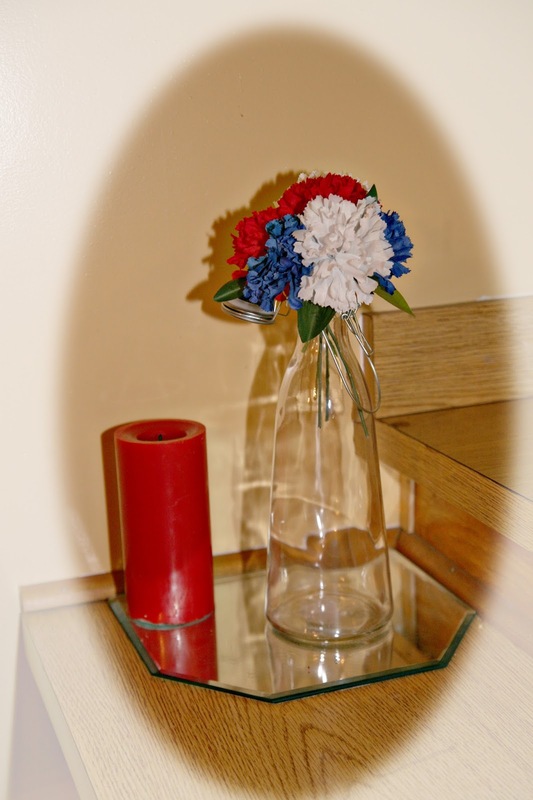 Well it worked out perfect for a July 4th centerpiece in my kitchen. Looks like one of the grandbabies might have tried to bite the apple! LOL! 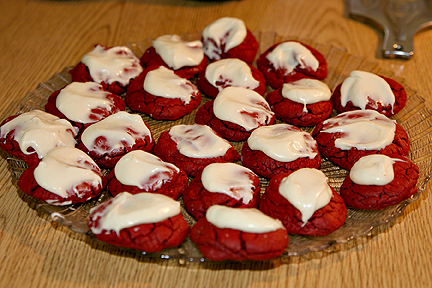 Or red Velvet cookies with Cream cheese icing! Simple bottle with a few flowers and a candle made this little corner complete. Cute Simple wreath I made for my front door. 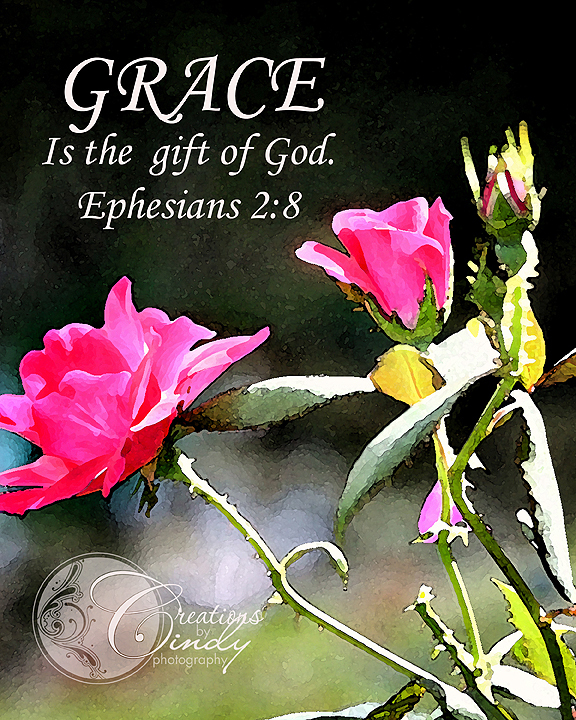 Now I want to announce The Winner of the 8x10 portrait of Grace giveaway. Dianna from "Joyful in His Presence" won! Congratulations Dianna! Pop over and visit with her if you get a chance. Dianna suffers from fibromyalgia and has the best testimony. Visit her and go under her section called "His gift to me". 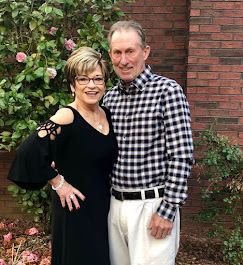 Dianna is a sweet gal that surely loves the Lord. 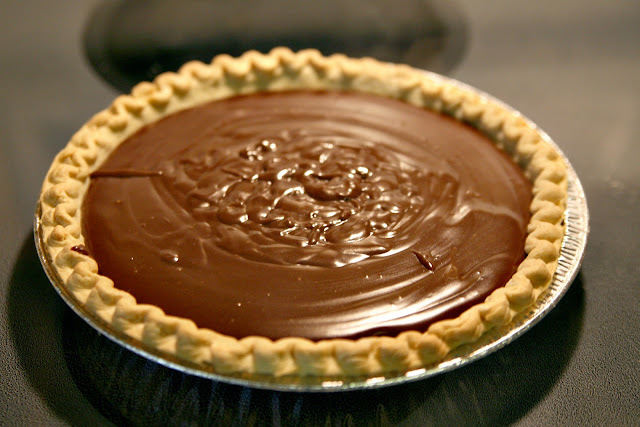 Stay tuned....Will share my recipe for the best chocolate and lemon pie you've ever eat!!! Congratulations to Ms. Dianna.....a very well-deserved recipient! She's a special lady. 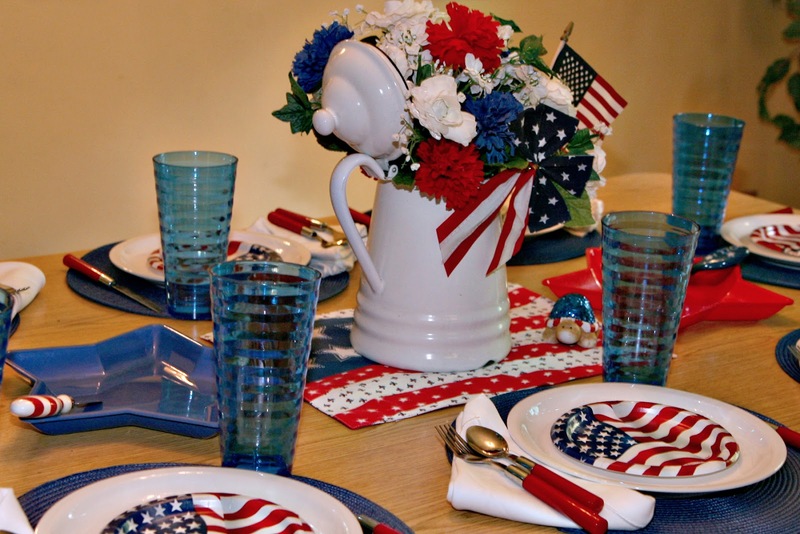 Love seeing your tablescape ideas with every holiday. 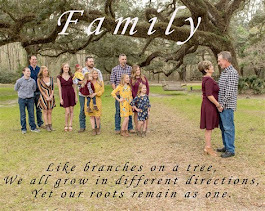 No wonder your grands look so forward to it, too!!! HOPE you have a great Monday!!! Deb, the grandgirls has got to where they love Nana's tablescapes! Training them right! LOL! Doubly thankful to you: For sharing your wonderful Red, White and Blue...such a heart thrilling splash of AMERICA ..and also for the sweet note you left me a like gramma's house a few minutes ago..I [also] read it with tears. At 22 months I still need to talk about him and it means so much when others allow that even more when they "get it"...Every memory is a priceless page in a very huge scrapbook and that stays open with the pages continually turning...but lest you get the wrong idea : I am able to be even now Joyful in the most heart wrenching/sad moments...That is so amazing to me to be walking around [in my life] whispering how blessed and rich in His bounty and the tears of being without him falling down my face at the same time...Our God is G O D...wow! [thanks for listening] On a lighter note you can peek at what I am doing if you wish on my fb photos/synched from phone pics...you will enjoy [fb: jonell Williams Harrison] I will find You. 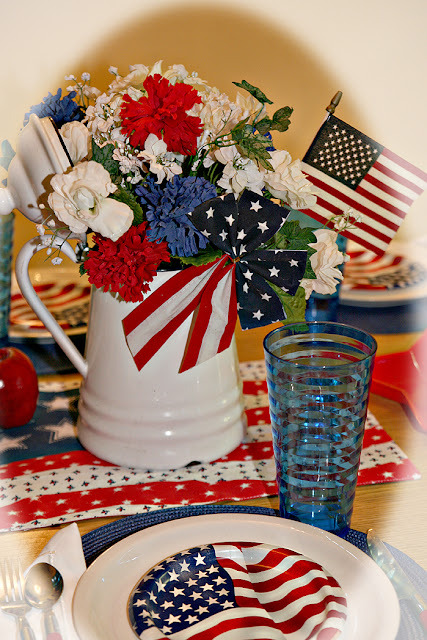 Love the red, white and blues and I really would like a cookie please mam! Get yourself a google account and I will personally send you some cookies! LOL! Just teasing my friend...I have several friends that has said...no account for me but I am going to reply. 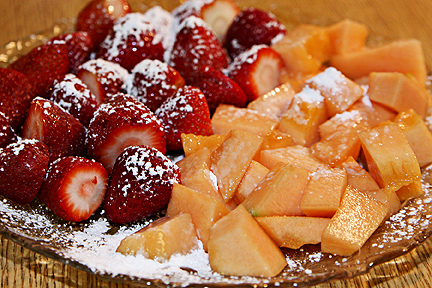 On another note...I wish I had that fruit right now...and some fried chicken and biscuits. Then maybe a cookie! Ha! Your table is gorgeous. I love how it pops! I can see why your grand babies like this one so much. Wow what fun and beautiful decorations! Those pies look so yummy! Happy Independence Day! Hi Cindy! Congrats to Dianna! I know she will treasure the artwork. You are amazing with the table-scape. Wow! And I love that you repurpose and use Dollar Tree. The candelabra idea with the dishes and apples is so inspired. 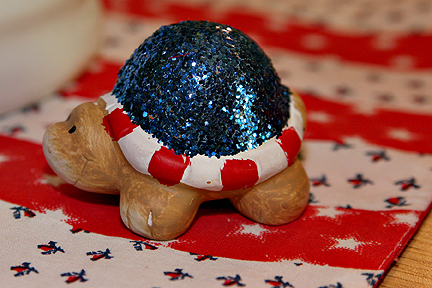 My little grandgirls would go nuts for that turtle! (I'm a Nana too :) ) The red velvet cookies look amazing, I could gobble them down with no problem! Thanks Ceil. Oh yes my friend...I repurpose, remake...reuse and love me some Dollar Tree! LOL! 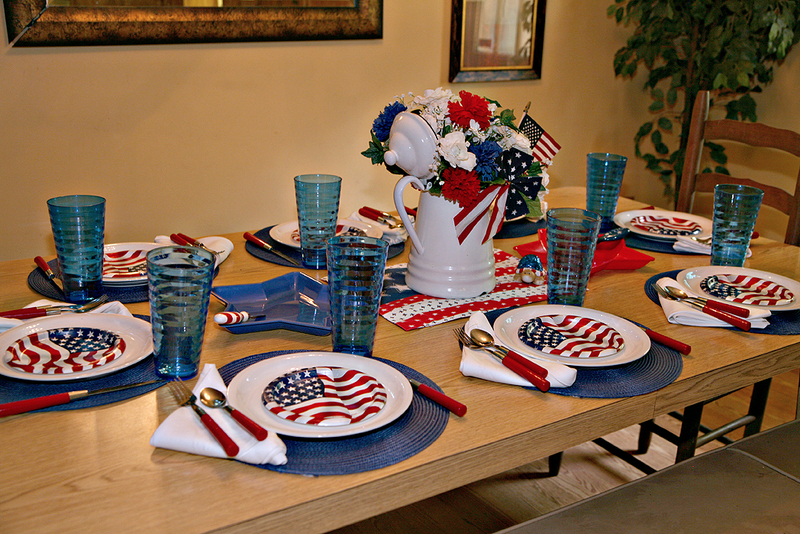 Hi Cindy, your patriotic tabelscape is wonderful. Love the plates from Dollar Tree for easy cleanup with the kids. 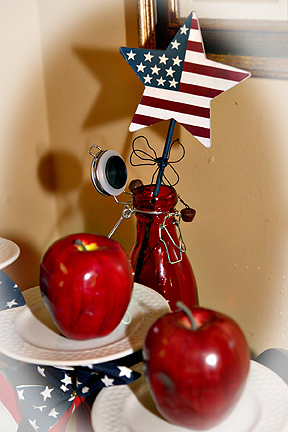 Your coffee pot is a great treasure to decorate with. Love the fruit and cookies and those pies look delicious. Congrats to the winner of your giveaway. 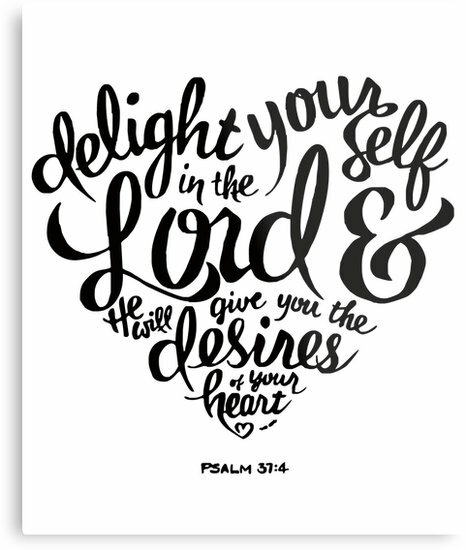 Have a blessed and special week. Thanks so much. I too love that coffee pot. What a beautiful and festive table, and your food looks delicious too!! Love that tablescape! It's all perfect! Your wreath is so cute. 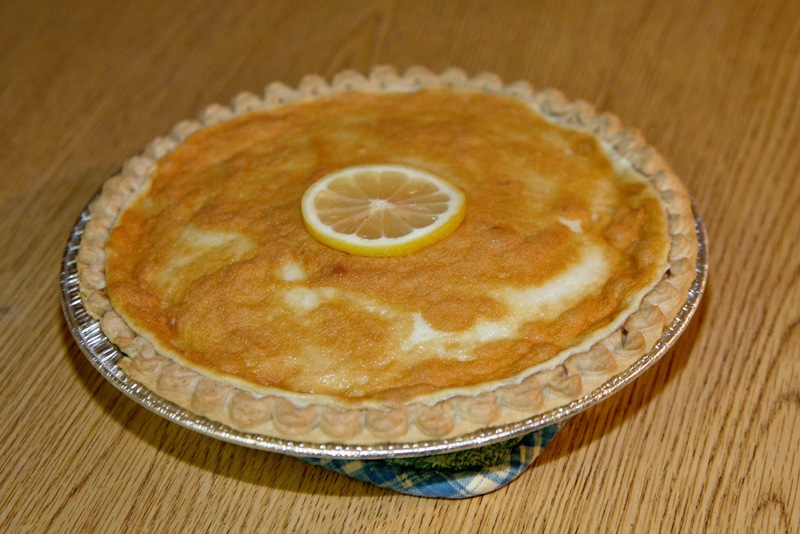 I want some of that pie!!! I tasted the lemon and it was good! Everyone said the chocolate was so good. Wow! Feel as if I've been in a wind tunnel you have time going by so fast! =D That's a very attractive tablescape! Hope I remember to come back for some pie. Your table looks so pretty, love all the red, white and blue. Can't believe the 4th is almost here. This year is flying by. I am so blessed to have won this beautiful giveaway. It will be treasured. Thank you so much. Thank you for sharing your holiday tablescape at my party...love how you used the DT plates (great idea). You will be featured at the party on Monday. Oh I am so excited! Thanks Linda.